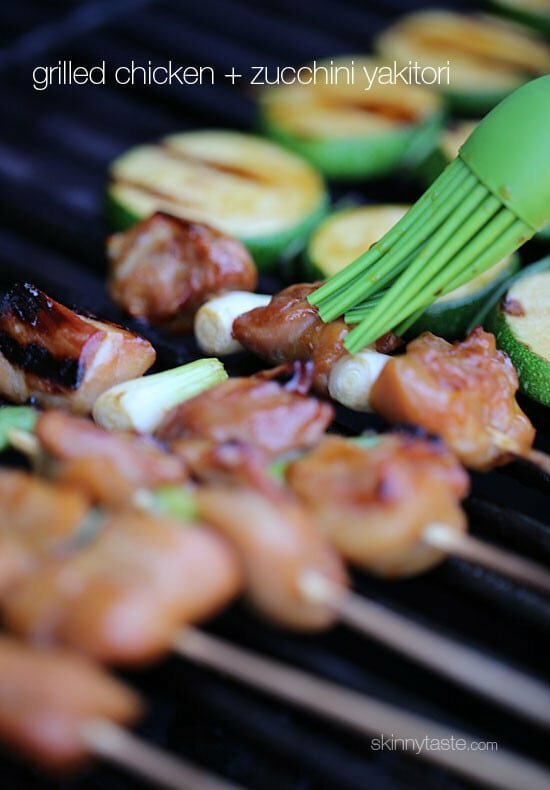 I love these Japanese inspired grilled chicken and zucchini skewers marinated with yakitori sauce and threaded onto bamboo sticks with green onions. 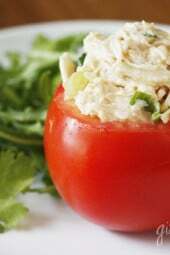 They are perfect as an appetizer if you’re having a backyard bash this summer, or you can turn it into a meal any night of the week served with rice, salad or more vegetables. Yakitori reminds me of my college days in Soho living on a student budget. Me and my BFF Gabbie used to meet 3 to 4 times a week after class at this cute little Japanese restaurant in the Village where paper origami birds hung from the ceiling and Japanese music played in the background. I didn’t have much money then, so I usually ordered the chicken yakitori off the appetizer menu which always came with white rice… a perfectly good meal when you’re broke. Now days I can make it myself, and although this could certainly serve a crowd as an appetizer, I still like to eat them for dinner like I did back in my college days. 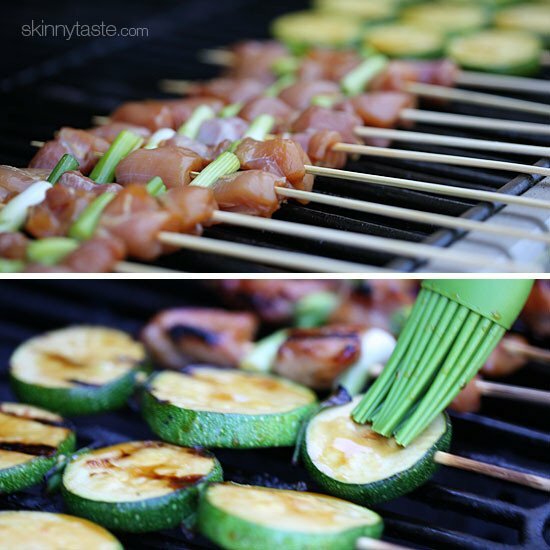 I also like to add some zucchini to my skewers so I’m grilling my veggies at the same time. As for the chicken, I prefer dark meat to white so I use Perdue Fit & Easy thighs, which calculates to a lot less points in recipe builder than generic thighs (I’m assuming because the generic isn’t trimmed of all fat? Not sure!) You could also use chicken breast if you prefer white meat. Only one tiny issue I had was it makes 14 chicken skewers, so to divide that in 4 servings, you are going to get 3 1/2 skewers. Oh well, you’ll just have to share!! There’s plenty of marinade left if you want to make more chicken or zucchini. Bring mirin, low sodium soy sauce, honey and crushed garlic to a boil in a medium-sized sauce pan, and cook over medium heat for about 5 minutes. Cut the chicken into 1-inch pieces and place in a ziplock bag; pour half of the marinade over the chicken. Place the zucchini in a second large ziplock bag and pour the remaining marinade over the zucchini. Meanwhile, soak the skewers in water 30 minutes so they don’t burn. Thread the chicken onto skewers, alternating with green onion so that each stick has 3 cubes of chicken and two pieced of green onion, discarding the chicken marinade. 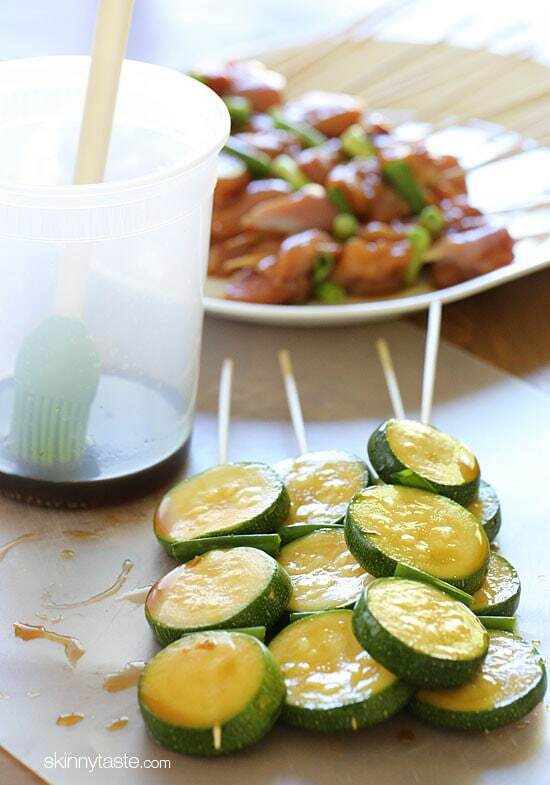 Thread the zucchini onto skewers, alternating with remaining green onion, reserving the marinade for basting. Preheat the grill or a grill pan over medium-high heat. 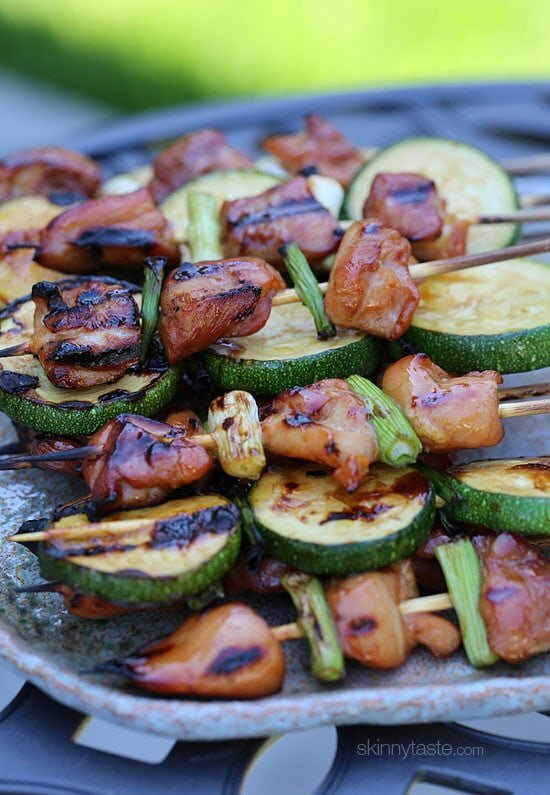 When hot, spray with oil then reduced heat to medium; grill the zucchini and chicken skewers about 5 to 6 minutes on each side brushing both sides of the skewers with the yakitori sauce during the last few minutes of cooking time. Makes 14 chicken skewers, 4 zucchini skewers. mirin, but it would actually be less. Pretty high in sodium for us that are restricted. Any ideas on cutting that down? I reduced the soy sauce by half. Check the label of the mirin you use as many brands have added salt. I couldn’t find one without added salt so I used a combination of white wine and unseasoned rice vinegar. Also make sure you’re buying chicken that doesn’t have added salt or is treated/injected with a sodium solution. Even with these changes we thought the recipe was delicious. Pingback: 5 Weight Loss Zuchini Recipes You Have To Try - Czaal is a source for deep thinkers, lifelong learners and truth seekers. Posts on science, self-improvement, psychology, unexplained mysteries. I’m a busy mom of two under three who works full time and tries my best to cook every night for the family, which can be rough! I just finished prepping this and I still have plenty of time to spare to spend some time with the kiddos before dad comes home! 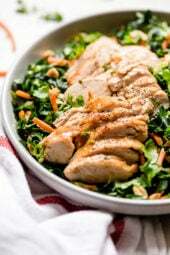 I sincerely appreciate all of the quick and easy meals… And they are absolutely are all delicious and never disappoint! Is the sauce supposed to get thick? Last time I made it the sauce was thin. I loved the flavors I just wasn't sure I did it right. Is there a recipe for yakatori sauce? I'd love to make these tonight. "Me and my BFF Gabbie used to meet 3 to 4 times a week"
Correction: "My BFF and I used to meet 3 to 4 times a week"
Next time you correct someone's grammar just remember: you sound like a jerk and no one cares. Perdue is better because generic chicken is pumped up with steroids and then injected with "chicken broth" which is mostly just salt and water. That makes it bigger and weigh more. It also is usually only trimmed on sides you'll see in the package. Generic chicken may be a little cheaper, but it is actually disgusting when you know why. Perdue chicken is fed better, has no steroids, and isn't injected full of "broth". I used to work at the meat counter at a popular grocery chain. And i would NEVER buy generic meats at any store. You can get off your horse now. Calm down. Any idea what I can sub for the honey? We are doing low carb and I'd rather not use it. I do have seasoned rice vinegar, which has a small amount of sugar. Think it would be ok if I just used that and the soy sauce? Actually, mirin and sake are not the same thing. Mirin can be found by the rice wine vinegar in the asian section of most grocery stores and is a sweet japanese cooking wine with seasonings. Sake is the generic term for rice wine. So excited to try this for tomorrow nights dinner! I had planned on finding something that I could throw in the crockpot so that dinner would be ready when I came home from work, but this looks so simple, healthy, and so AMAZING all together that I just can't pass up the opportunity to make these! Thanks once again for a fantastic recipe! Can't wait to try it! I wish people would try these recipes BEFORE they comment. This was fantastic! I could not find mirin sake so I used Moscato d'Asti. Would marinating overnight be too long? Today I had a time crunch so couldn't skewer & grill. Instead I used a grill pan on the stovetop and got it done really quickly. I had added yellow bell pepper chunks to the veggies, and I also substituted ginger syrup (my current obsession) for the honey. Served over steamed white rice. Very simple, easy and tasty. Will make again and already planning to serve mini skewers of this recipe at a poolside cocktail party this summer. Thanks Gina! Made this and loved it! It was delish and my 14 month old gobbled it up! Another winner that will be on the rotation this summer. Delicious! Thanks! My family and I love all of your recipes! I love zucchini! This was a really great pairing. I don't really do the skewer thing, so I just made this as a meal in a bowl. It was fantastic. My boyfriend loved it, too. We're going to make it again this week! Made this for dinner tonight & my 4yo twins LOVED it, as did the hubby. It was so delicious. I will definitely be making it again soon. 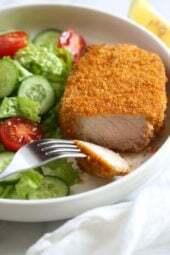 Where do you find this brand of chicken breasts? I live in AZ and haven't run across it. It doesn't matter what brand you use, as long as the fat is all trimmed off. Basically they sell it very trim and lean. Amazing !! Made it with the Edamame Fried Rice!! Definitely a keeper!! This looks amazing. Is it like Korean BBQ or Bulgogi? Because that would be amazing. There are so many veggies you could sub in and out too. So exciting. Great recipe. I made this last night and it was delicious. I used chicken breasts (could not find thighs) and I cooked it in a cast iron skillet (no grill). Came out great. Thanks! This was delicious. We made them tonight and loved every bite! I added pineapple to the chicken kabobs and mushrooms to the zucchini. Thanks for all of the great (and easy) recipes! What is mirin sake and where do ib find it? When I google it it lists mirin and sake as two separate things. Thanks!!! It's Japanese, rice wine. It's in the Asian section of the supermarket. Gina, I put this in my WW recipe builder and got 9 WW+ points/serving for 4 servings (34 points total). For some reason all of your recipes with boneless, skinless chicken thighs come out higher than listed. Are you weighing them again after cutting off the fat? I calculated on Recipe builder with Purdue Fit & Easy which is trimmed of all fat. I'm not sure that the generic chicken thigh is for a thigh that is trimmed of fat, it doesn't say. I noticed Bare chicken thighs are also the same as Purdue. Also, I noted that I tossed most of the marinade, which may effect the points. Thanks! It seems like the Perdue and "Just Bare" brands are lower in points than standard boneless, skinless thighs according to the recipe builder. Not sure why, but good to know for the future. I've never had yakatori sauce but that's about the last time I'll say that! Looks great and I have to try it. Thanks for posting the recipe. yum! great excuse to buy some sake! I love grilled zucchini. This chicken and zucchini looks great. Looking at Jessica's comment mushrooms sound really good too! Made this last night. Fabulous! 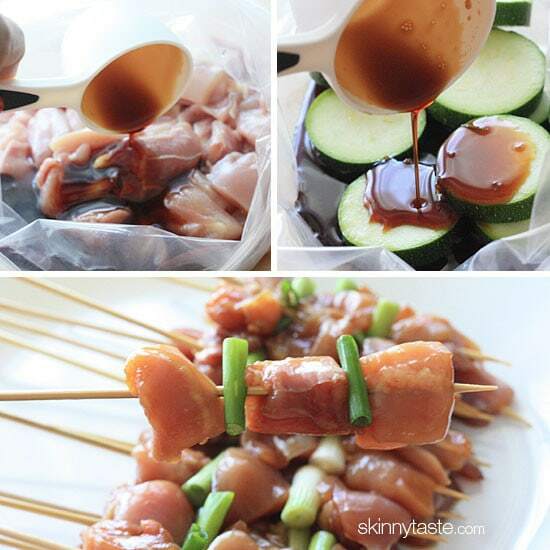 What great little skewers packed with flavor! These will work on an indoor grill or even a pannini press if you have one. Can't wait to make these,yum! These sound delicious, and I am determined to make them, but can't have a grill at my condo, does anyone know if you can cook skewers on a george foreman grill? Probably a silly question, but I have only cooked plain meat on it so far. Yes – you can use George to grill skewers. I want to make it RIGHT NOW!!!! Any substitute for the sake? If it's because of the alcohol, I'd use rice wine vinegar. If you don't mind using alcohol, you could substitute with white wine. The blog is awesome! Thanks for sharing all these healthy and tasty food for us. It is so amazing of how attractive the food looks like that only 213.5 Calories. This is going into my diet plan! Gina, what of grill do you use? I use my indoor grill but think I need to invest in a new one. Don't know what brand it is, I've had it a few years. These are going on my menu for tomorrow! 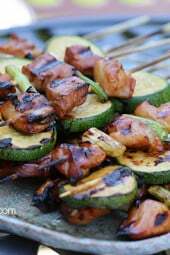 I think I'll add some mushrooms to the zucchini skewers, yum! I was just thinking the same thing about adding mushrooms. Those look actually quite perfect! The shocking thing is, I actually have all of these ingredients… including the Mirin. Yay me! LOL We'll be giving these a try (with breasts). 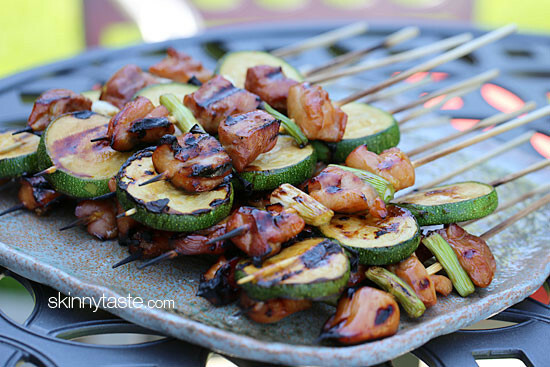 I'm all over anything that involves zucchini, especially grilled zucchini! These look delicious! I will be making it and pinning it! Do you happen to know of a substitute for the sake? Totally going to make these! Oh gosh those look so good! I'm half Japanese and love Yakitori and anything asian flavored! Such a perfect main part of a meal for a day after lifting too. Hooray for protein! I love the sweet & salty flavors you used in these skewers, Gina! They look like they'd make for a delicious low-carb meal or BBQ party food!